When you connect one object to another, DataMigrator draws an arrow between them. These arrows, or connector objects, specify the logic that governs what is executed next in a process flow. The connection logic may be unconditional or conditional, represented graphically by colored arrows. Conditional logic is set by default. However, you can edit the connection to change the nature of the condition or to make it unconditional. Green arrows indicate that the next object will be processed if the previous one runs successfully. This is the default when you draw an arrow from one object to the next in a single path, as shown in the following image. Red arrows indicate that the next object will be processed if the previous one fails to run properly. This is the default for the second arrow when you draw two arrows from the same object to other objects, forming two branches in the flow. Since the first arrow (the green one) means run when the flow is successful, it follows that the second arrow (the red one) means run when the flow fails, as shown in the following image. Purple arrows indicate that the next object will be run based on a custom condition you define. You can use statistical or global variables (&&variables) in custom conditions to test specific conditions, return codes, or values based upon which branching will occur. For example, you might want the flow to branch differently based a particular error message number. For related information, see Branching in a Process Flow. Note: When multiple conditional arrows are used, the first object where the condition is met is run. Email connects to any other object type. Follow these steps to edit a connection condition between a flow or a procedure and one of the following object types: a flow, a Parallel Group, a Procedure, or an Email. Drag the required objects into the process flow workspace. To view or edit the connection condition, double-click the arrow connecting the two objects. The Condition window opens, as shown in the following image. For a single connection, OK is the default. For a second connection, FAILED is the default. Click an option button to change the condition. If you wish to specify a Custom condition, click Custom. 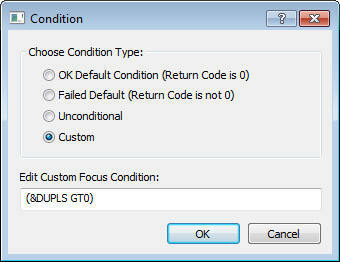 The Edit Custom Focus Condition box becomes active. Type the code for the condition you want to apply. Typically, you use a global (&&) variable, DataMigrator variable, or statistical variable in your custom conditions to test specific conditions, return codes, or values based upon which branching will occur. Click OK to close the condition box. Click the Save button to update the process flow. You can set a custom condition for a connection between objects in a process flow. In this case, a connection will become active if duplicate rows are rejected while a data flow is run. The number of duplicates will be included in an email that is sent if the condition is met. Note: Your DataMigrator Server must be configured for email notification to complete this example. For details, see Configuring DataMigrator Server Operations. In the DMC, right-click an application directory in the navigation pane, select New, and then click Flow. Click the Process Flow tab. Drag the DMDUPLG data flow object from the ibisamp application directory in the navigation pane into the workspace, to the right of the Start object. Create a connection by right-clicking the Start object and dragging to the DMDUPLG data flow object. On the Flow tab, in the Insert group, drag an email object into the workspace, to the right of the DMDUPLG data flow object. 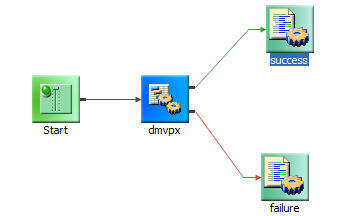 Create a connection by right-clicking the DMDUPLG data flow object and dragging to the email object. 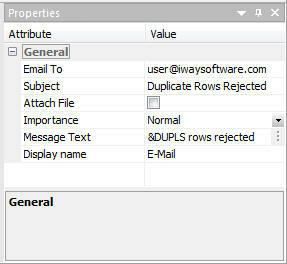 Double-click the arrow between the DMDUPLG data flow object and the email object. Right-click the connection arrow and click Edit Condition. The Edit Custom Focus Condition field becomes active. Type the following in the Edit Custom Focus Condition box and click OK, as shown in the following image. Note: Ensure the Data Flow that was added to the Process Flow has the Run as Stored Procedure properties setting enabled. This will maintain the continuous connection, and will enable the reference to the variables at run time. Right-click the email object and click Properties. In the Address To box, type an email address. In the Subject box, type Duplicate Rows Rejected. Type the following in the Message Text box, as shown in the following image. This connection will become active if duplicate rows are rejected while a data flow is run, and an email notification will be sent with the number of duplicate rows. To access the Condition dialog box shown in the following image, from the process flow workspace, double-click a connection arrow between objects, or right-click a connection arrow and click Edit Condition. Executes the connection if the prior object executed successfully. Executes the connection if the prior object failed to execute. Executes the connection regardless of the success or failure of the prior object. This option is only available when there is only one connection. Allows you to set a custom condition for the connector. The code for a custom condition. 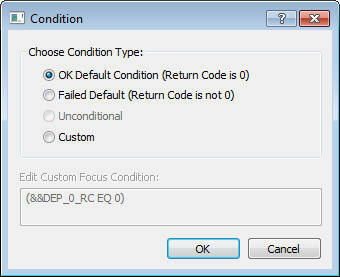 Enter a condition using FOCUS dialog manager that evaluates to true or false. The ability to set connection logic enables you to create branches within a process flow. You simply connect multiple objects to the object from which you want the branching to begin. The branching process flow shown in the following image is built in Exercise 2: Creating the Process Flow. It is strongly suggested that you complete these exercises in order to create the branches shown here. As you do so, you will become familiar with many aspects of data and process flow design in the DMC. Drag an object into the workspace following the object from which you want the branching to begin. To build the first branch, connect the object at the starting point for the branches to the object you just dragged in. A green arrow is created by default. To build the second branch, drag another object into the workspace and connect it to the object at the start of the branch. A red arrow is created by default. If you wish to change the connection conditions for any branch, double-click the arrow and edit the condition in the Conditions window. Then click OK. Note: You can also create branches using custom conditions. Note, however, that while you can use multiple custom conditions to specify different branches, you should not use custom conditions with OK and FAILED conditions. When multiple conditional arrows are used, the first object where the condition is met is run.